Designed for sports and the street, the iconic Skullcandy headphones range delivers superb sound and head-turning looks. These are over-ear, in-ear and wireless headphones that get you noticed. There are three main Skullcandy headphones ranges to choose from. Over-ear headphones provide remarkable comfort, noise-cancelling properties, and a more immersive listening experience. 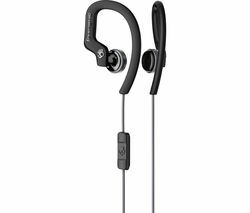 Skullcandy In-ear headphones and ear-hook headphones are ideal for sports and people on the move. Wireless Skullcandy headphones like the Hesh 2.0 get rid of tangled cables, but still giving you complete control over volume, track skipping, taking calls and more via on-headphone controls. 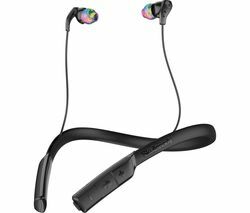 Wireless Skullcandy headphones connect to your devices via Bluetooth, so you can listen to your favourite tracks, playlists and podcasts anywhere. The whole Skullcandy range is compatible with all smartphones, and feature built-in microphones and inline controls to allow you to take calls on the go, never missing a call while you’re listening to music. High-level input power delivers impressive dynamic range – from high-pitched highs to banging bass you can feel, and at an affordable price tag. If you’re looking for exceptional audio quality that’s truly portable and smartphone compatible, our surprisingly cheap Skullcandy headphones are a great wallet-friendly choice.